You want a delicious, satisfying dinner, but you don’t need to feed a family of four. These no-fuss, single-serving recipes are the solution. Cooking for one can be even more challenging than feeding a crowd. It seems counterintuitive, but it’s simply a math problem. Most recipes yield at least three servings, so if you’re dining solo—and don’t want leftovers around—you’re stuck doing the math to modify amounts, which can drive anyone to call it quits and grab fast food. Try to resist. 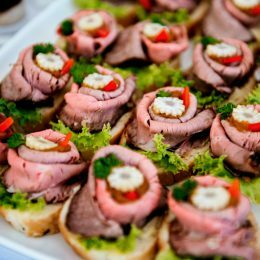 Not only because preparing a meal at home is almost always better for your waistline and your wallet, but it’s also a nice opportunity to wind down after a long day. Plus, we have proof it can be quick, easy, and totally satisfying. 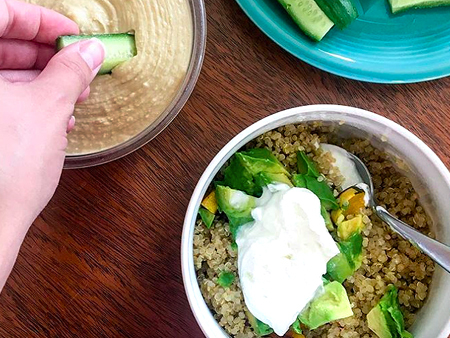 Here, registered dietitians who are familiar with the cooking-for-one challenge share their go-to single-serving dinners—most of which can be made in 15 minutes or less. 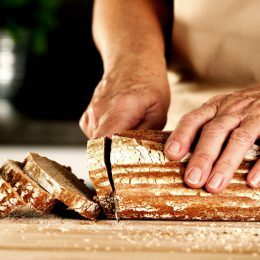 You’ll notice some recipes call for precooked ingredients, like whole grains and vegetables. This is in an effort to keep things as streamlined as possible, but it’s not required. 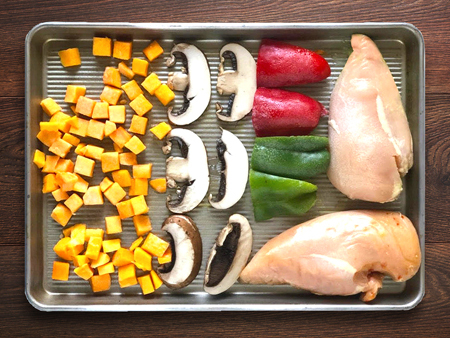 You can cook your ingredients whenever you prefer—at the beginning of the week if you like to meal prep or right before you make each meal. “My favorite go-to dinner for one is a warm bowl of zucchini noodles with Bolognese sauce,” says Ha Nguyen, R.D. 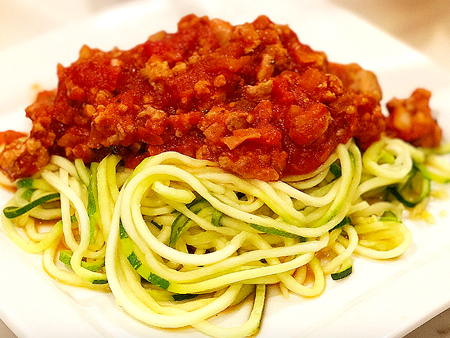 “I like it because it requires such simple ingredients: spiralized zucchini—which many grocery stores now sell in the prepared produce section—a jar of tomato sauce, vegetables, and lean ground beef or turkey.” That’s it! What to do: In a large skillet over medium heat, cook zoodles until al dente, about 3 minutes. They’ll release water, but it will evaporate. Set zoodles aside in a bowl, and wipe skillet clean. Return skillet to medium heat. Add olive oil and onion, and sauté until slightly soft, about 3 minutes. Add ground turkey, season with salt and pepper, and cook, breaking meat apart, until no pink remains. Add garlic and reduce heat to low. Add marinara and cook to heat through. Serve sauce over zoodles in a bowl. 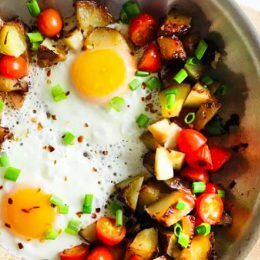 What to do: Add olive oil to a large skillet over medium heat. Add corn, and season with salt and pepper. Cook, stirring, until corn is slightly soft, about 2 minutes. Add brown rice, black beans, and spinach, and cook until rice and beans are hot and spinach is wilted. Serve topped with pico de gallo. What to do: Mix quinoa and roasted vegetables in a bowl. You can eat it cold, or you can microwave it if you prefer it warm. Stir in paprika or cumin. Top with Greek yogurt and avocado. 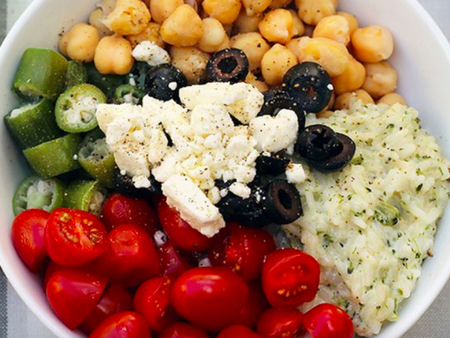 “One of my favorite go-to healthy meals for one is a simple rice bowl with beans and veggies,” says Amy Gorin, R.D.N., owner of Amy Gorin Nutrition in the New York City area. What to do: Microwave rice according to package instructions. Steam okra or broccoli in the microwave. In a bowl, top rice with remaining ingredients. 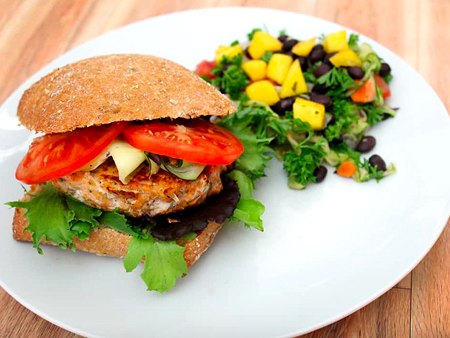 “My favorite go-to dinner for one is a salmon burger with a side salad,” says Nazima Qureshi M.P.H., R.D. What to do: To make the salmon burgers, use a food processor to pulse all burger ingredients until combined but still slightly chunky. Form into 4 patties. Freeze the patties on individual squares of parchment paper in an airtight container. To make the meal: Heat 1 teaspoon olive oil in a large skillet over medium heat. Cook salmon patty until cooked through and lightly browned, about 4 minutes per side if frozen. Place patty on the bun, and add burger toppings of your choice. 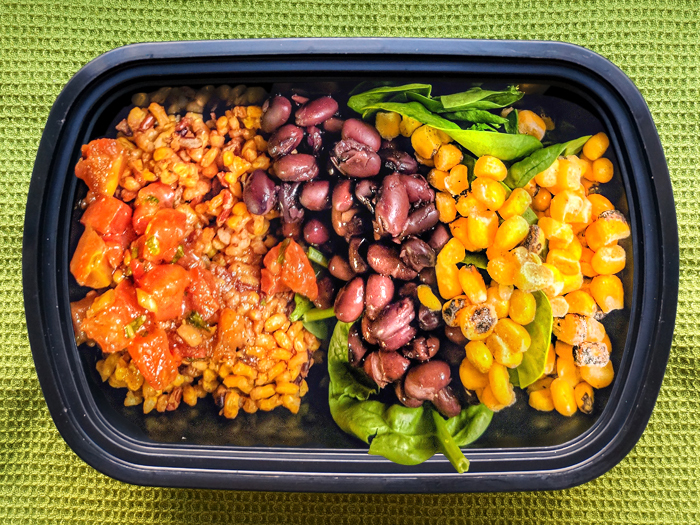 Toss together salad greens, black beans, chopped fruits or vegetables, lemon juice, remaining 1 teaspoon olive oil, and some salt and pepper. Serve salad with burger. What to do: Preheat oven to 375° F. In a large bowl, toss chicken and vegetables in olive oil, spice of choice, and some salt and pepper. Spread in a single layer on a baking sheet. Bake 25 to 30 minutes, until chicken is cooked through and vegetables are soft.